Kitchen range hoods that are vented to the outside are a great way to remove heat, odors, moisture, and smoke from your home when cooking. The fans in range hoods are rated by the cubic feet of air they move per minute (CFM), and it’s important to buy a range hood that moves enough air to be effective. Below are several different ways to calculate the CFM for a range hood. You should also take into account the size of your kitchen in cubic feet when calculating the size range hood fan needed, since a larger kitchen needs more venting to clear the air than a smaller room. To find the fan needed for your size kitchen, multiply the number of cubic feet in the room by the number of air exchanges (15), then divide by the number of minutes in an hour (60). The burners on a gas stove produce a lot more heat than those on an electric range, so a kitchen with a gas stove requires a larger capacity range hood vent fan. The size, shape, length, turns, and cap on the range hood ductwork adds resistance which reduces the amount of air the vent fan can move, requiring additional CFM for the fan. When using smooth, round 8” diameter, metal pipe, add one CFM per foot of pipe, plus 25 CFM for each elbow, and 40 CFM for a roof cap. To make the final calculation, take the larger of the CFM rating for stove width, room size, and stove burner. Add the additional CFMs needed for the ductwork to arrive at the minimum CFM range hood to buy. In the examples used above, if your kitchen has a 30” stove (250 CFM minimum) in a 16’ x 16’ x 8’ room (512 CFM minimum), and a 40,000 BTU gas stove (400 CFM minimum) you would want a fan rated at 512 CFM or higher, plus 100 CFM for the ductwork for a total of 612 CFM or more. Thanks for sharing about How to Calculate Kitchen Range Hood Fan Size! It’s helpful info, I was wondering how it worked. I got a result on a calcula tor I found on the internet and didn’t know if it was right or not. Turns out it was good. I wish they add the duct work elbows, etc too. Thank you very much for the most relevant and useful article. 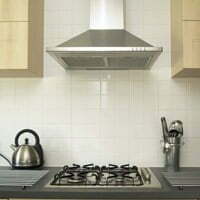 If a range hood liners outside dimensions are 24″x 42″ does the fan inserts dimensions have to be close to that or can I use a fan insert with a 12″D x 20″W dimension? I don’t leave many comments on plenty of blogs however i sensed i needed to here. please how can calculate the ventilation requirements for a battery room? Terrific blog, I am going to spend more time reading regarding this subject. must do the trick! Have a pleasant day! Is your sizing recommendations based on any code data, i.e. International Mechanical Code, Residential Building Code, International Building Code, State Building Code, NFPA, etc.? Hood Fan Size | Today’s Homeowner <Loved it! The most efficient range hoods always turn out to be pyramid shaped, and that is usually due to the fact that the blower inside is not confined to a box and has a larger open space to draw air from. When it comes to sizing a range hood, it is not a bad idea to go one size larger when using powerful gas stoves because it provides a larger surface area and makes it easier for the range hood to function efficiently. That being said, the blower inside the range hood is very important. When using large powerful gas stoves, a small blower will likely turn off if the heat is too high. It is recommended to use range hoods with larger blowers in this case. When it comes to electric stoves, most times it is effective to use a range hood that is the same size as the stove (i.e. 30″ range hood for a 30″ stove). The main thing is to remember that the blower size and type that is inside the range hood is equally as important as the size of the hood itself. In addition, the duct size will dictate the amount of CFM levels that can be achieved with a range hood; the larger the duct, the more efficient and powerful the hood will be (given that the blower inside is powerful enough). I have the same question as SL. How do you calculate the CFM for a 36″ induction cooktop? My kitchen is only 11’4″ x 10′ and is open to the dining room. How do you calculate CFM for a 36 inch induction cook top? Thanks for the information. Maybe I missed in the comments anything about factoring in the height above the stove. I have an island unit being installed and the glass hood is at my head (and it hurts). The installer believes he can modify it to install higher but I wonder how effective the unit will be then. Do I need a higher cfm fan to mount it higher? Please, when quoting ASHRAE requirements. Add handbook year and paragraph. Avoid being sloppy in respect to the ASHRAE organization members. our under cabinet hood range is 1/8″ too big to fit between the cupboards. what do we do? The cabinets are oak. we wanted to replace the 28 yr old hood to match our new appliances. Any help appreciated. For an open concept home, how do you calculate the room size? Do you just use the measurements for the kitchen area minus the breakfast nook and family room or should those be included? How many cfm does a wall vent cap require? Presumably fewer than 40 for a roof cap? Very nice info. My question is; what will be the ducting losses for 4 inch chimney? Thanks so much for this piece of useful info. Pls I’ve gotten a (4.2 x 16.9 x 2.7)m hotel kitchen with four electric cooker control units to deal with in terms of range hoods so kindly advise me on the size and number of extractor fans I’ll need. Thanks!!! I have just moved into a new home and chose not to have the builders install a range hood as I plan to purchase a chimney style myself. We were told by the kitchen design company that by the builders standards we can only get a one with 350 CFM or less. Why would this be? We have 9′ ceilings, and the vent is about 6″ from the ceiling and vents directly to the outside (no turns etc). We’re in a 2600 square foot home with our kitchen wide open to the great room, and not only is a fan under 350cfm difficult to find, I also fear it won’t be enough for the large space. 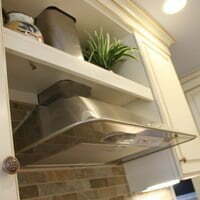 Glad to hear out article on sizing a range hood was of help! Great article! As a Kitchen Remodeling Designer this will help me in giving advice to my clients. We are remodeling a house and installing a microwave above the freestanding 30″ stove. We will vent from the stove to the microwave through the ceiling then in between the joists and on through to the outside. Only one turn to go through joists then straight piping (around 20′) to the outside. My question is: What size piping to use–We thought maybe 6″?? My question is I’m replacing this good for nothing kitchen exhaust fan. The physical size of existing fan is enormous, 42 inches can I go to a smaller size. But have the CFM higher. Great! U have shared the knowledge in very simple method. Easy to understand, Thanks. just confirmed the approach with what I’ve learnt over time and its just PERFECT! the world will be a easier and better to live if all the people would be like you that share their knowledge and expertise. THANK YOU SO MUCH FOR SHARING. INFO IS VERY HELPFUL. I have 4″dia straight chimney duct going through the wall to the top of roof at a height of 25 feet from chimney hood. What will be pressure drop across the chimney duct & what capacity chimney is required to send the exhaust at the rof top. Dish WASH area How exhaust CFM Required . Wow! Helpful info, I was wondering how it worked. I got a result on a calculator I found on the internet and didn’t know if it was right or not. Turns out it was good. I wish they add the duct work elbows, etc too. Thanks for all the help Danny! thank you on explain. Please can send standard of gas stove? Notably absent from your show and your site…a make-up air unit to counter the negative pressure effect that range hoods often contribute to. Especially important considering clothes dryers, older lower efficiency gas furnaces, gas water heaters, and bathroom exhaust fans already induce back-drafting conditions. Of course that may be less of a concern with older leaky houses but could be dangerous in homes retrofitted with better insulation and updated windows…essentially the tighter structures. Just thought I’d mention the omission.